Special Containment Procedures: SCP-1566 is to be stored in a standard containment locker, and access restricted to testing researchers only. Testing of SCP-1566 is only to be performed with D-class personnel. All testing is to be observed remotely; no essential personnel may occupy the chamber while testing is in progress. Testing chambers are to be equipped with remotely-activated CO2 emitters, to facilitate termination of affected subjects once testing is complete. Description: SCP-1566 is a green cotton t-shirt, manufactured by ████████ ███████. 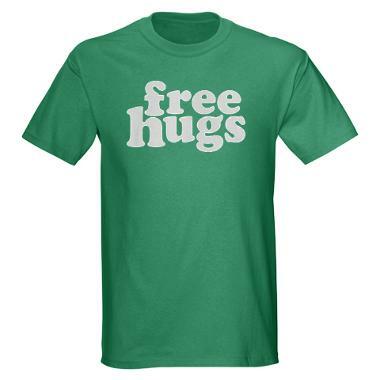 The text "free hugs" has been screen printed into the chest by a third party. The vast number of independent screen printing services available make tracing the precise origin of SCP-1566 effectively impossible. Chemical analysis of both the shirt and the polyester mesh composing the text have revealed nothing out of the ordinary. When SCP-1566 is worn by a human subject with functioning arms (testing with higher primates and limbless subjects pending approval), it imposes an irresistible compulsion on any other person reading the printed text. Whether this is a memetic effect caused by unique visual properties of the text or a psychic compulsion caused by agents unknown is under investigation, and is the focus of current tests. Remote observation via camera, or even using a series of mirrors, nullifies SCP-1566's effect, making closed-circuit television the preferred method of observation during testing. Those who read the "free hugs" text exhibit a powerful urge to embrace the subject, citing feelings of sympathy and affection. When a reader embraces the subject wearing SCP-1566, the subject in turn is irresistibly compelled to return the gesture. This appears to be a physical compulsion; most subjects express great distress at the involuntary movement of their arms. When embracing the reader, the subject exhibits strength far surpassing their normal capabilities, causing massive trauma to the torso of the reader. The subject will continue squeezing until the reader expires, usually due to a combination of collapsed lungs, internal bleeding, and the piercing action of snapped ribs. Readers are not dissuaded by the traumatic deaths of others, and will persist in attempting to embrace the subject. Neither are they dissuaded by the protests or verbal warnings of the subject, insisting that the subject "Just needs a hug to cheer him up!" (Or similar phrasing.) The subject is typically too distressed to connect their predicament with SCP-1566 and remove it, though they can and often do attempt to flee the area to avoid further human contact. Once the subject wearing SCP-1566 has been rendered unconscious or deceased, the anomalous effects cease, and it may be safely read, removed, stored, and contained. 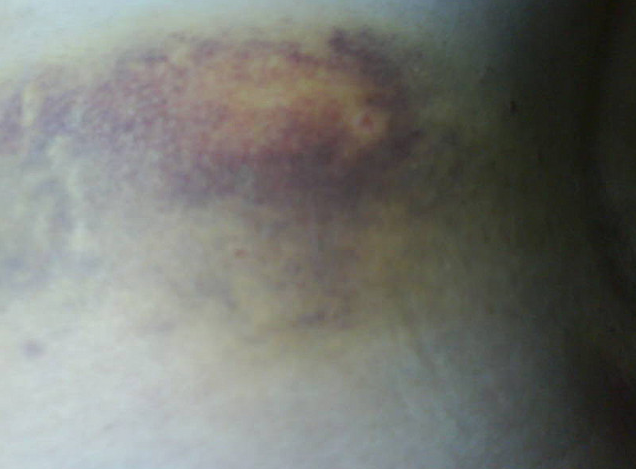 Torso trauma of Mr. ████ ███ prior to treatment. Addendum 1566-1: SCP-1566 recovered from the corpse of Mr. ████ ████████, shot and killed by ███ █████ Police while forcefully embracing Mr. ████ ███ at the █████-███ International 20██ event in ███ █████. 20 confirmed casualties were attributed directly to SCP-1566, including Mr. ████ ████████. Item subsequently retrieved by MTF Iota-22, "Rabid Fanboys." Mr. ████ ███ treated at scene, amnestics administered, full recovery expected.